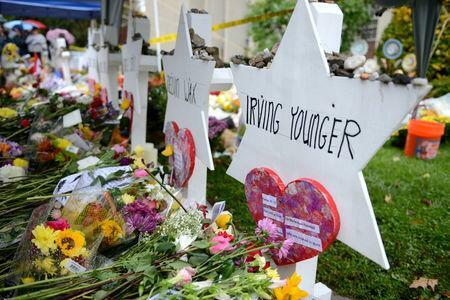 PITTSBURGH (Reuters) - The man accused of massacring 11 people at a Pittsburgh synagogue last year in the deadliest attack on a U.S. Jewish institution pleaded not guilty on Monday in federal court to a dozen additional charges including hate crimes. The suspect, Robert Bowers, is accused of bursting into the Tree of Life synagogue in the city's Squirrel Hill neighborhood on Oct. 27 armed with three handguns and a semi-automatic rifle, and firing on congregants as he shouted "All Jews must die." One of Bowers' attorneys, Judith Clarke, a death penalty specialist, said the defense hoped to settle without trial. A negotiated plea deal could allow Bowers to avoid facing the risk of execution. Bowers, who had frequently posted anti-Semitic slurs and conspiracy theories online, sat quietly through the hearing, dressed in a short-sleeved red jumpsuit and shackled at the ankles. He replied "yes" when U.S. District Judge Donetta Ambrose asked if he understood the charges, and he said he wanted to be tried by a jury. A member of the congregation in attendance at the hearing, Jon Pushinsky, said "We are here to bear witness. We are here to show that this act of violence will not deter us from serving our community." On the day of the attack, Bowers, a Pittsburgh resident, said online, "I can't sit by and watch my people get slaughtered. Screw your optics, I'm going in." The attack followed a wave of politically motivated pipe bombs mailed to prominent Democrats and heightened national tensions ahead of November's midterm congressional elections.